The beauty of pizza is that, in the right hands, a pizza crust becomes an artistic pallet for practically any combination of ingredients. 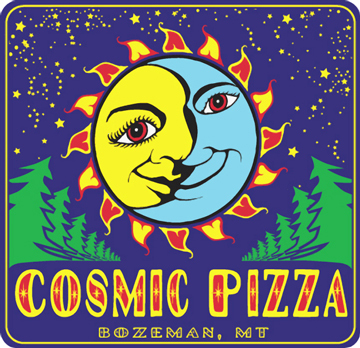 The folks at Cosmic Pizza take the art of making pizza seriously. If you want a standard 3-topping, go anywhere. If you want a wide range of unique, cant-get-enough-of-it combinations, the selection here is huge. Try The Chick From Mars with chicken, garlic, almonds, onions, romas, mushrooms, eggplant, and zucchini. For the vegetarians try The Centaurus with walnuts, onions, spinach, garlic, provolone and gouda. You get the idea. And the garlic dipping sauce that accompanies every pizza will make you a dipper for life. Think you can do better? With 6 sauces, 9 cheeses, 13 meats, and 25 vegetables to choose from, the combinations are endless.